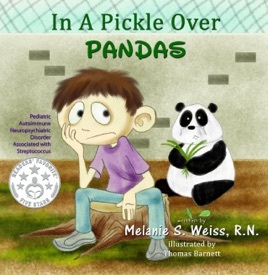 This book is about a young boy’s journey with a harrowing illness called PANDAS, an acronym for Pediatric Autoimmune Neuropsychiatric Disorder Associated with Streptococcus. He wakes up one morning, and overnight, is stricken with unusual and frightening symptoms that turn his world upside down. Some of the symptoms he experiences are anxiety & OCD. This happened all because an autoimmune response caused dysfunctional antibodies to invade the basal ganglia of the brain instead of fighting off the streptococcus bacteria. The boy has never even heard of PANDAS. After a long road, filled with doctor visits, blood draws, procedures & surgery, he is finally on the road to recovery. In time, he is able to forget about this harrowing illness. Then, the only PANDAS he knows of are the black and white bears at the zoo. About the author - Melanie S. Weiss, RNC-MNN, BSN has been a registered nurse for thirty years, certified in maternal-newborn nursing. Her goals in writing this book were to explain a frightening illness to the children afflicted with it, in an informative but non-frightening way, and to raise awareness about the disorder. She is also the author of the article, “The Pandemonium of PANDAS.” Melanie lives in Long Island, NY with her husband and three sons and is an employee of the North Shore LIJ Health System. Keywords - PANDAS, PANS, Pediatric, Autoimmune, Neurological, Disorder, Streptococcus, Anxiety, OCD, Antibiotic. Excellent book on learning about this disorder call PANDAS. Not only does this book explains to the child what is going on with him it also teaches the parents what they have to do to fight this disorder. Every parent should read this book and learn about PANDAS! This is a wonderful book for children and their families to help them better understand PANDAS. It explains the disorder in easy to understand terms for both children and adults. This is a must read for anyone who has PANDAS or knows someone with it. I loved this clear and sensitiive explanation of PANDAS in the form of a picture book for children. It makes dealing with PANDAS much less scary for children AND their families. Weiss writes with compassion and even explains science and medical treatments in terms kids can understand. The illustrations are adorable and humorous— the little boy and his “panda's” facial expressions are priceless as they battle anxieties and strive to heal. This is a charming and thoughtful book.